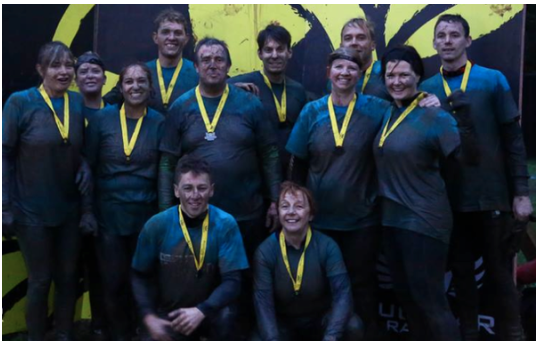 I’m so pleased to report that after hours of pushing their minds and bodies to their physical limits EVERY member of Team Paragon successfully crossed the finish line of The Nuclear Fallout Event to collect a well deserved finishers T-Shirt and medal. The 11 Platinum Members and myself set off at 1.30pm to do the assault course which I estimated would take us 2 hours. We all managed to cross the line at 5pm, so there was an extra 1 and a half hours as an extra bonus that we didn’t expect! The course was incredibly challenging, incredibly tiring and incredibly muddy but everyone was determined to make it to the finish line. 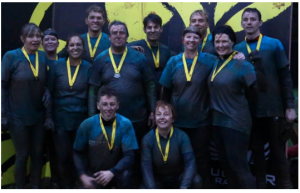 After hours of running, climbing out of ditches, jumping into murky water, crawling through tunnels, and scrambling through thick mud that smelt and looked more like something worse than mud, not one single member would give up and kept spurring each other through. Whilst facing fears of heights, water and claustrophobia head on, we all successfully completed the race. Well done Crew, what a fantastic achievement! I truly am so proud of everyone in TEAM PARAGON, this event really pushed a lot of our members out of their comfort zones. Setting yourself a goal like this may seem completely crazy, but creating something to aim for, training for it and completing it really fills you with the best sense of achievement. This challenge WAS NOT EASY by any means, but that makes completing it feel even more special. When we complete something that we thought was once impossible, that’s when we really grow. Boldly climbing over obstacles that put us way out of our comfort zone, boosts our self confidence through the roof! That’s when we’re really learning about ourselves and what we can really do when we put our minds to something. Taking a risk and entering something like this allows us to think back and say to ourselves “Yes, I did that”, it also lets us think, “What else could I achieve if I put my mind to it?”. Only by taking great risks can we ever achieve anything truly great. Things don’t just happen…..we make things happen. We are already talking about and looking to book our next batch of challenges. No doubt there will be another event where new friendships and bonds will be made along with some memories that will not fade either.